The Tufts School of Dental Medicine is undertaking a multi-year, multi-phase master plan to promote sustainability and environmental quality. The implementation of the master plan began in 2008 with a LEED Silver Certified five-story vertical expansion, which now houses the program that was formerly located on the lower floors, and provided the necessary ‘swing space’ that will allow the renovation of the lower floors to occur with minimal disruption to the functioning clinics and classrooms. The Level 2 Renovation project, the second phase of the master plan, was completed in late 2011 and received LEED Gold Certification in February 2012. 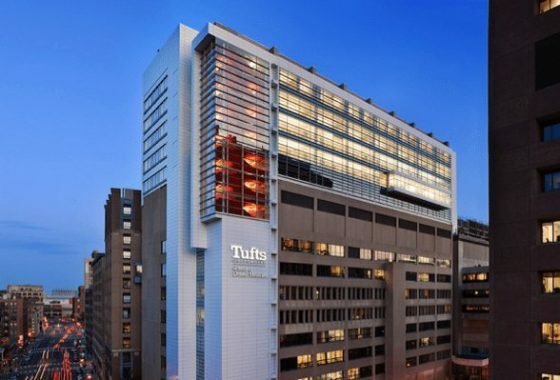 In April 2008, Tufts University School of Dental Medicine embarked on a major vertical expansion project to add five floors and 95,000 square feet to the existing building. The new space expands patient clinics, classrooms, and offices, as well as Continuing Education and research facilities. The Vertical expansion project has achieved LEED Silver Certification and includes provisions to promote sustainability and environmental quality. The Leadership in Energy and Environmental Design (LEED) Green Building Rating System provides independent, third-party verification that a building project meets the highest green building and performance measures. Commissioning Agent: Environmental Health & Engineering, Inc. The expansion project is considered a ‘sustainable site’ because it is built upon a pre-existing site in an urban context and will not impact a new location. In addition, the building is located adjacent to the subway system and the project does not provide additional parking spaces in order to encourage widespread use of public transportation. Additionally, the project uses light colored roofing and paving to minimize heat gain at the site. The project team reduces water usage throughout the building by 30% through utilization of water-efficient technology such as waterless urinals, dual flush toilets, metered faucets, and reduced irrigation. In order to minimize energy consumption, the building employed high efficiency systems such as in-floor radiant heat and daylight sensors to control lighting. The project team acquired local materials whenever possible to cut down on transportation costs and reduce carbon dioxide emissions, as well as stimulate the local economy. The team used FSC (Forest Stewardship Council) certified wood. FSC is an international nonprofit organization that certifies forest products and allows consumers to choose products from socially and environmentally responsible forestry methods. In addition, materials high in recycled content were used wherever possible, such as ceiling tiles, flooring, and aluminum door & window frames. The contractor developed a waste management plan that sorted and diverted all materials that could be recycled to further reduce project impact. In addition to saving energy and environmental impact, LEED has developed standards to insure a healthy environment for the project’s users. During and after construction, an indoor air quality plan will be used to provide clean air for the end user. Low emitting materials will be installed to minimize off gassing at installation. Users will be able to have enhanced control of temperature and lighting in their spaces. Extensive exterior & interior glass is included to afford views to the outside and natural light in the majority of spaces. The second floor of the Dental School building has been completely renovated to house part of the pre-doctoral teaching program along with an Emergency Clinic, while leaving the existing building envelope intact. The renovated second floor has been designed to accommodate and separate public and private space. All clinic and patient functions are located off the main patient corridor on the east side of the floor, while all traditional academic function and offices are located around the more private west corridor. This project is the second phase of the Dental School’s multi-year, multi-phase master plan. The Level 2 Renovation project was designed to meet a set of stringent sustainable goals and achieved LEED Gold Certification in February 2012. LEED (Leadership in Energy and Environmental Design) is a voluntary, consensus-based rating system for developing high-performance sustainable buildings. The second floor renovation will be considered a ‘sustainable site’ because it is building upon a pre-existing site in an urban context and will not impact a new location. As the result of a formal parking and traffic study performed at the inception of the master plan, no new parking spaces are proposed as part of this renovation. This study shows that existing parking facilities are sufficient as most student, staff, faculty and patients utilize nearby public transportation.In addition, the building is located adjacent to the subway system and the project will not provide additional parking spaces in order to encourage widespread use of public transportation. The project plans to achieve a 40% water savings over the baseline with the use of dual-flush toilets, low-flow urinals and metered lavatory faucets. The project is planning to achieve significant energy savings through the use of occupancy sensors in the offices. The project will be installing occupancy sensors for over 80% of the connected lighting load. The sensors will automatically turn lights off when the users are no longer in the space, which will prevent the lights from being left on accidentally. The project is targeting a 20% lighting power reduction from the ASHRAE 90.1-2007 standard. The Dental School has committed to purchase Energy Star equipment whenever possible including: computers, monitors, copiers, printers and refrigerators. 91% of the equipment in the project is Energy Star rated equipment. Additionally, energy efficient hand dryers will be installed in each of the toilet rooms instead of paper towel dispensers. The hand dryers will have hygienic touch free operation, use up to 80% less energy than other hand dryers and eliminate paper towels as a source of waste from the day-to-day building operations. Tufts has also purchased Green-e Energy Certified Renewable Energy Certificates offsetting 100% of the Dental School’s second floor power consumption for the first two years after the renovation. The project includes three built-in single-stream recycling stations on the second floor, but there are also individual recycling bins associated with each trashcan in the offices and in the clinic. Additional larger stations are located in the clinic waiting areas. These extra recycling locations will help to encourage both staff and patients to recycle. The project team has acquired local and regional materials, and materials with high recycled content whenever possible. The contractor developed a waste management plan that has recycled 84% of the construction waste. In addition to saving energy and reducing the environmental impact of buildings, LEED has developed standards to ensure a healthy environment for the project’s users. During and after construction, an indoor air quality plan will be used to provide clean air for the end user. Low emitting and healthy materials will be installed to minimize off gassing at installation, and green-cleaning strategies will be implemented during occupancy.